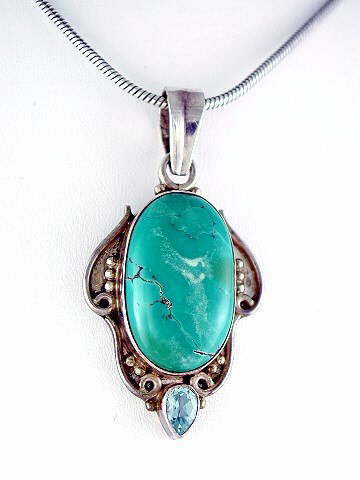 Top quality polished sea green/blue Turquoise cabochon pendant, set in an antique-style 925 sterling silver mount and finished with a faceted pear-shape Blue Topaz. This most beautiful of crystals has been prized across the globe for thousands of years. It is considered one of the Master Healing Stones and legend has it that it will change colour to warn the wearer of impending danger! It purifies, strengthens and enhances all four energy bodies and when coupled with Pearl it can be a great emotional balancer whilst also helping create focus to aid personal goals. The various varieties of Turquoise around the world each differ slightly in colour and some have slightly differing metaphysical properties. These include: Tibetan Turquoise (contains the OM vibration, pale greenish/blue in colour. Often Chinese Turquoise is passed off as Tibetan, so always try to buy from a trusted source), African Turquoise (quite green), Chinese Turquoise (also quite green/blue), American Turquoise (turquoise) Sleeping Beauty Turquoise (pure deep blue turquoise). Topaz carries a joyful energy and is considered a very lucky stone, attracting good fortune to the wearer. The blue in particular is a stone of spiritual love and peace. It is also a manifestation stone, helping to realize dreams in the physical realm.